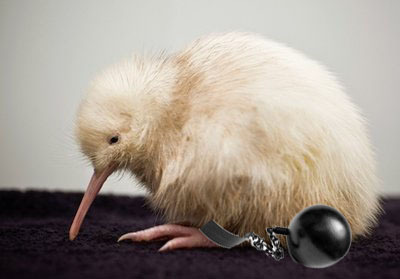 WHANGANUA – Tufty, an adorable baby Kiwi bird and resident of Whanganua, is faced with charges of first degree assault at a New Zealand court. The trial, which was brought by the bird’s latest victim, has gone on for the last two weeks and is soon to conclude. Tufty was crossing the street near Auckland when local woman Mary Crumplebottom caught sight of his fluffy self shuffling across the road. Although Tufty was making legal use of the crosswalk, his overwhelming cuteness unintentionally caused the 48-year-old wife and owner of three cats to trip and fall, injuring her left arm and shoulder. Despite public sentiment that the fuzzy wuzzy little cuddlebird is blameless, Tufty has taken full responsibility for the incident. Tufty told reporters that he planned on allowing his full body to be shaved and tattooed to ensure that his heart-wrenchingly adorable appearance didn’t cause any problems in the future. During our last interview with Tufty’s legal team, lawyers indicated that the grief-stricken Kiwi bird has taken up residence in a purple tube sock until he can be safely transported away from all possible future victims. In other news, Muffin the sleepy baby hedgehog faces human trafficking charges in Poland.